first solar Archives - Page 2 of 5 - Solar Love! Southern Power announced Wednesday that it had acquired controlling interest in the 300 MW Desert Stateline solar project in California. The news comes less than a week after Southern Power, a subsidiary of Southern Company, took controlling interest from Canadian Solar in the 200 MW Tranquillity Solar Power Project. Southern Power now takes controlling interest in one of its existing largest solar assets. The 300 MW Desert Stateline Facility in California is being developed by First Solar and represents the fourth shared acquisition between the two companies. In addition to operating the facility upon completion, First Solar will also retain the remaining interest in the project alongside Southern Company. Completion of the project will take place in phases, working on from the initiation of construction in October, 2014. When finished, the completed project — located on 1,685 acres of federally managed public land in San Bernardino County — will be made up of approximately 3.2 million thin-film photovoltaic solar modules provided by First Solar, and is expected to generate electricity for the equivalent of nearly 100,000 average households. A new study has concluded that utility-scale solar PV systems across the US are “significantly” more cost effective than rooftop solar PV systems. Specifically, the study, conducted by economists at global consulting firm The Brattle Group, found that utility-scale solar PV systems were more cost effective at achieving the economic and policy benefits of PV solar than rooftop or residential-scale solar was. 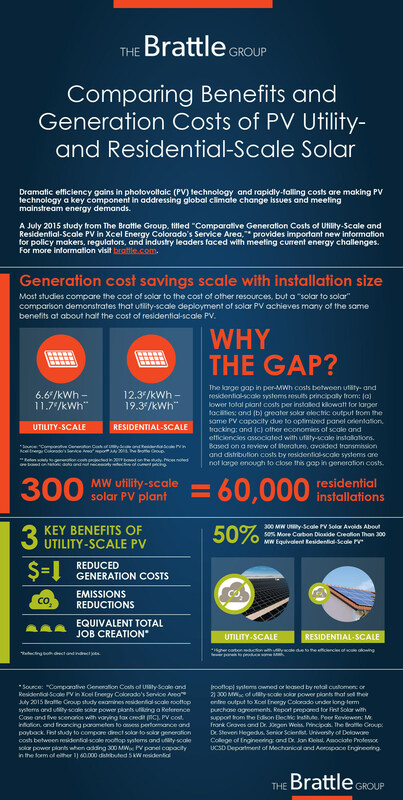 The generation cost of energy from 300 MW of utility-scale PV solar is roughly ½ the cost per kWh of the output from an equivalent 300 MW of 5kW residential-scale systems when deployed on the Xcel Energy Colorado system, and utility-scale solar remains more cost effective in all scenarios considered in the study. The report itself was commissioned by American thin-film photovoltaic manufacturer and utility0scale developer First Solar with support from Edison Electric Institute, while Xcel Energy Colorado provided data and technical support. Specifically, the report examined the comparative customer-paid costs of generating power from equal amounts of utility-scale and residential/rooftop-scale solar PV panels in the Xcel Energy Colorado system. The authors of the report put these figures into perspective, including the national average for retail all-in residential electric rates in 2014, which were 12.5¢/kWh. Secure, clean, and affordable energy is driving the US economy toward a more prosperous future. Solar and wind power generation are making significant contributions to this rising prosperity. And in Texas, where everything is bigger, this is true in a very big way. Solar and wind projects on the ground and in the Texas pipelines are generating big numbers in both gigawatts (GW) and revenue. Though famous as the epicenter of the traditional US oil and gas industry, Texas is also home to a growing advanced energy market encompassing solar and wind energy, natural gas electricity generation, and cost-effective energy efficiency measures saving money for building manufacturers and owners. Advanced Energy in Texas, a new report from Navigant Research commissioned by the Texas Advanced Energy Business Alliance (TAEBA), measures the booming economic footprint of the advanced energy market in the Lone Star State. A broad range of technologies, products, and services, advanced energy encompasses wind and solar power generation, natural gas production, energy efficiency, and energy storage. Distinguished separately from conventional energy products, advanced energy is described as “the best available technologies for cutting costs and improving reliability” of both today’s and tomorrow’s energy supply. Advanced Energy in Texas represents the first comprehensive study of the advanced energy market in Texas. With an estimated $16 billion in revenue for 2014, this represents 8% of the total US advanced energy market. It also represents enough money to buy the Dallas Cowboys, the most valuable franchise in the National Football League, five times over. The report gives big credit for advanced energy growth in Texas to the state’s pro-business, pro-growth attitude, combined with well-designed policy structures, including renewable energy and energy efficiency standards. Texas also has the nation’s most open and competitive market for energy resources, managed by the Electric Reliability Council of Texas (ERCOT). • The Building Efficiency segment, including energy-efficient lighting, HVAC, and retrofits to commercial and public buildings, was the largest in the Texas advanced energy market, and drew in revenue of $5.5 billion. • Electricity Generation produced $3.6 billion in revenue, $2.3 billion of which came from wind energy installations alone. • Fuel Production pulled in $2.7 billion. Compressed and liquefied natural gas for vehicles was included in this number. • The Transportation segment gained $2.3 billion in revenue. Hybrid electric vehicles, natural gas vehicles, and the supporting infrastructure for fueling these vehicles was included. • The Electricity Delivery and Management segment, with $1.2 billion, was driven by transmission projects required for integrating larger amounts of advanced energy into the transmission system. • Fuel Delivery brought in $25.8 million in revenue from natural gas fueling stations. According to the new TAEBA report, solar is on the Texas launch pad, with 10 GW of new capacity expected by 2029. Wind energy is booming even bigger, with more than 14 GW already installed. Now producing over 10% of Texas’ electricity supply, an additional 10 GW of wind capacity is also in the pipeline. As noted above, energy efficiency is already big in Texas, but there is still plenty of room for improvement. The report finds that efficiency measures account for one-third of the cost of power generation, and note that there are still huge potential additional savings and peak load reduction available. Energy efficiency and demand response are critical factors in helping to prevent electricity blackouts, as well as helping customers save money. “Solar is taking off in Texas,” said Jim Hughes, CEO of First Solar, a global provider of photovoltaic solar energy solutions. “Our Barilla Solar project is the first solar power plant in the country to offer electricity on an open contract basis, and it illustrates how solar has become a reliable, competitively priced component in the state’s balanced energy portfolio. We see an enormous growth opportunity for solar in Texas.” First Solar (NASDAQ: FSLR) is a vertically integrated solar power provider with more than 10 GW of installed capacity worldwide. Along with the Barilla power plant, First Solar has several other projects in various stages of development in Texas. RES Americas is a renewable energy, transmission, and energy storage developer. Its projects in Texas total nearly 2,500 MW, including the 278 MW King Mountain Wind Ranch, the 60 MW Whirlwind Energy Center, and the 166 MW Hackberry Wind Farm. RES Americas was also a contractor for the 30 MW Webberville and 41 MW Alamo 1 solar projects. Near completion is its Keechi wind project, owned by Enbridge Inc., which will power Microsoft Corp. near Dallas–Fort Worth. A complete list of companies participating in TAEBA is available at texasadvancedenergy.org. First Solar has completed a 550 megawatt solar power plant in Riverside County, California. This part of the state is in the southern area inland from Los Angeles. The new solar plant is owned by GE Energy Financial Services, Sumitomo Corporation of America, and NextEra Energy Resources. It utilizes over 8 million solar modules. Three hundred megawatts of power from the plant will be sold to PG&E, and the remaining 250 will be sold to Southern California Edison. First Solar is no stranger to huge solar power plants. The photovoltaic energy provider developed and completed the 550 MW Topaz solar project in San Luis Obispo County, California. And it only took about two years to complete it. In December of 2014, a 250 MW solar power plant became operational in California as well. So, in the last two months, California has seen at least 1,350 MW of solar power become operational just from new solar farms. This total is in addition to all the rooftop solar that is constantly being installed. The Solar Energy Industries Association (SEIA) has written that one megawatt of solar power can provide electricity to about 164 homes. So, the recent addition of 1,350 MW in California could power ~221,400 homes. Did you hear about this big solar power surge on any of the national news networks? Probably not, but there is a very positive solar power trend taking place in many parts of America that is not well represented in the media. Another benefit of these large solar power plants is the number of jobs they create during the construction phase. For example, the first 550 MW plant First Solar developed, the Topaz facility, created about 400 jobs. Of course, such a large project stimulates the local economy. The second 550 MW plant is the same size so it is reasonable to expect that about the same number of jobs was created for the installation period. Also, a smaller number of jobs are generated to operate and maintain such a large plant, so the economic stimulus continues, though at a smaller scale. Finally, these huge solar power projects also contribute to local economies because they pay taxes to local authorities, which goes back into the community. Thin film photovoltaics (PV) will become the technology preference in the 100 GW solar market, says one manufacturer. Founder of Manz AG, Dieter Manz, told PV Tech recently that bigger production scales, along with advancement of global solar markets, will make thin-film PV markets ready for prime time. Manz also suggests his company’s backing of copper indium gallium selenide (CIGS) will pay off, saying the lower cost scale of CIGS is better than other market technologies. “If we talk about the next generation and bigger markets, we are convinced crystalline technology is not the technology of choice. Thin-film will have a much better cost position, thin-film is much more reasonable to make it bigger – if you look at the cost structures of really big factories, 5GW or bigger, thin-film technology has a lot of advantages,” Manz added about thin-film’s competitive cost advantage over crystalline technology. Manz sees lots of potential in thin-film PV, such as for rooftop solar and building integrated photovoltaic (BIPV). However, firm interest from utility-scale sectors from the globe’s top PV markets will continue dominating growth by far, he said. Manz is not the only one who has gone big on thin-film PV. Earlier this year, we reported that US-based First Solar (the #1 thin-film solar manufacturer and developer for years) at its Ohio manufacturing plant created the highest efficiency for a non-concentrating cadmium-telluride (CdTe) cell, at 21%. 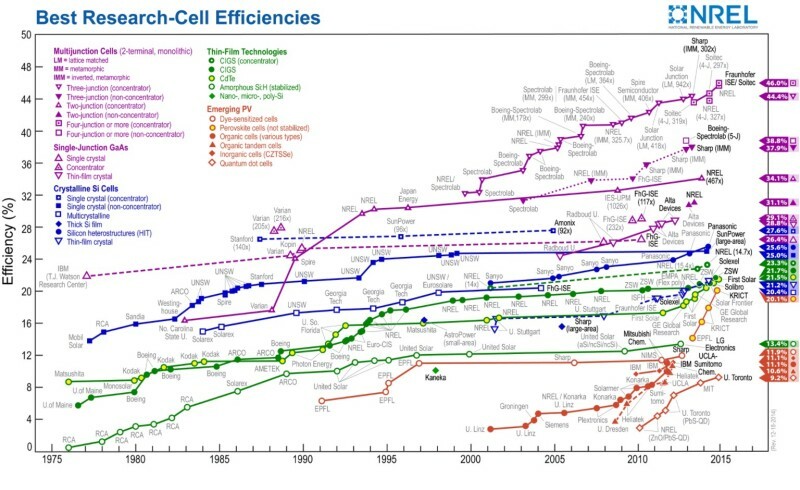 In 2013, thin-film PV production was 3.5 Gigawatts-peak (GWp), according to German based Fraunhofer Institute for Solar Energy Systems ISE, showing there is much room for growth. Conventional solar prices continue to fall, but so do thin-film solar prices, and their efficiencies have been improving much more quickly, so expect thin-film PV to increase within the solar market in the future, as solar energy becomes much more prevalent in our energy mix. Even though the state of Georgia has plenty of sunshine historically it hasn’t done that well with solar power development. Utility and state politics have been the main barrier, but apparently that resistance has been fading, at least somewhat. For example, recently it was announced that the largest solar power plant in Georgia will be constructed. First Solar will build a 131 MW utility-scale solar power plant for Southern Power in Taylor county. Using a 25-year power purchase agreement, the electricity generated by it will be sold to three Georgia electric corporations. Currently, Georgia has about 141 MW of solar power capacity. Adding 131 MW will almost double that amount, and in just about two years. The new plant is scheduled for completion towards the end of 2016. About 1.6 million solar modules will be installed and they will have some sun tracking capability. This means they will have an ability to follow the the arc of the sun in the sky to help maximize exposure to it and therefore generate more electricity. Is is a big deal for a southern state to nearly double its solar power capacity in a short time? It must be noted that Georgia’s southern neighbor, Florida, also has plenty of sunshine but has been a solar power laggard. Florida also has copious amounts of real estate development and rooftop space for solar, but politics is stubbornly resisting it. So, Georgia is definitely to be commended for being able to adapt to the new reality that solar power is now much more affordable than in the past, and is a good alternative to developing new coal and nuclear power plants. Arizona is another conservative state with abundant sunlight that is meeting with some resistance to solar power. Georgia apparently has shifted away from a bunker mentality when it comes to solar power and will allow it to grow there gradually. It should also be noted that constructing such large solar power plants increases new jobs, though most of them are only for the construction phase. There will probably be a number of permanent jobs created when the plant is finished to operate it.